An internationally prominent faculty, state-of-the-art facilities and new technology combine to make the University of Oklahoma Health Sciences Center a leader in education, research and patient care. 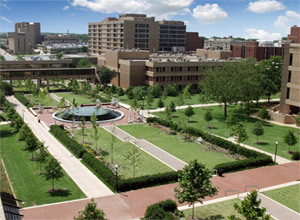 One of only four comprehensive academic health centers in the nation with seven professional colleges – Allied Health, Dentistry, Medicine, Nursing, Pharmacy, Public Health and Graduate Studies – the OU Health Sciences Center serves approximately 4,000 students in more than 70 undergraduate and graduate degree programs on campuses in Oklahoma City and Tulsa. Students and residents receive clinical training at on-site institutions, including the OU Medical Center, The Children’s Hospital and Veterans Affairs Medical Center. In addition, affiliate training programs are maintained at hospitals and clinics throughout the state. The OUHSC strategic plan for research targets and builds upon existing research and clinical strengths to achieve a healthier future and vigorous economy for Oklahoma. The key areas of research targeted are cancer, diabetes, neuroscience/vision and infectious diseases/immunology. The OUHSC already had a solid core of basic and clinical researchers in these four areas, plus the largest biomedical infrastructure in the state. Through recruitment, the OUHSC continues to grow its ranks of top researchers. The Stephenson Cancer Center is the largest public-private biosciences initiative in state history, and is Oklahoma’s only comprehensive academic cancer center. The Cancer Center has become a nationally recognized leader in research and patient care, and Oklahomans no longer need to travel out of state to receive all-inclusive state-of-the-art care. The new 210,000-square-foot building is designed to meet the medical, emotional and practical needs of patients and their families. Harold Hamm Diabetes Center is one of the top diabetes centers in the world for adults and children with type 1 and type 2 diabetes and home to one of the largest group of diabetes researchers in the world. With operations at the center’s facilities on OU’s Oklahoma City and Tulsa campuses, as well as affiliated sites across the region, the center engages in novel research aimed at progress toward a cure for diabetes and its complications, providing improved patient care, and preventing the spread of diabetes through education and early detection. Research at the OU Health Sciences Center has led to the development of several Oklahoma companies, including Caisson Biotech, which just entered into a development and license agreement with Novo Nordisk, representing a total deal value of potentially $100 million, as well as Altheus, Biolytx, Inoveon, Nantiox, Pure Protein, and Selexys, located in the University Research Park. 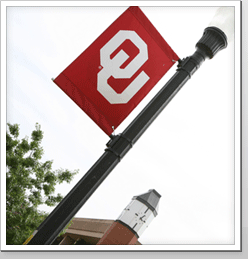 Other companies at the Research Park such as Urocor, Charlesson and Genzym have had or continue to have close association with active research programs at the OU Health Sciences Center. The research enterprise at the OU Health Sciences Center also provides training for undergraduate and graduate students who will continuing economic growth in the state.